2011 landslide along SR-14, 8 miles east of Cedar City, Utah. 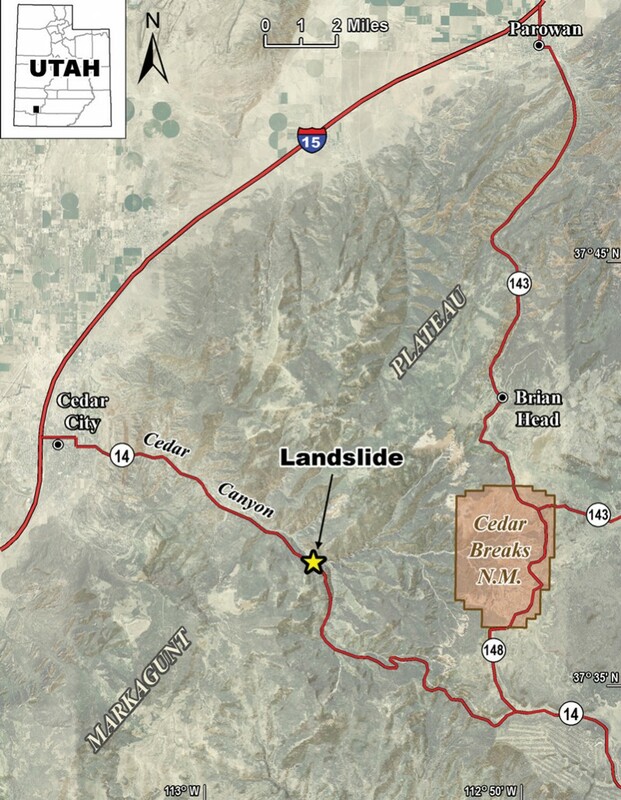 At approximately 5:00 a.m. on Saturday, October 8, 2011, a large landslide detached from the south side of Cedar Canyon about 8 miles east of Cedar City, Utah. 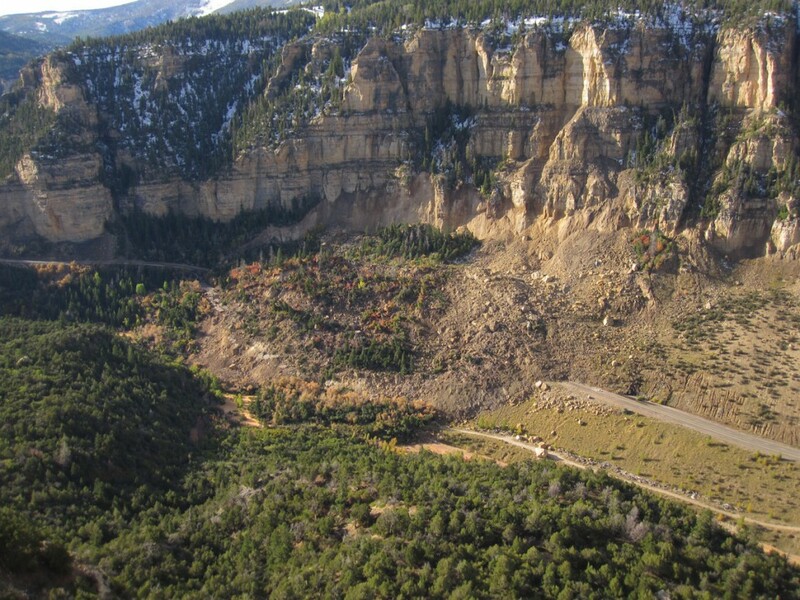 The landslide quickly moved downslope, displacing part of and burying the remainder of an approximately 1200-foot-long section of Utah State Route 14 (SR-14), an important transportation link between Interstate 15 at Cedar City and U.S. Highway 89 to the east. The landslide then continued to the bottom of Cedar Canyon where it partially blocked Coal Creek, causing a series of small ponds to form before the stream re-established its flow path. The landslide was approximately 1000 feet long, up to 1700 feet wide, and an estimated 50–75 feet thick. The Utah Department of Transportation (UDOT) estimates the landslide volume at about 4 million cubic yards. Fortunately, no motorists were on the affected section of SR-14 when the landslide occurred. Cedar Canyon incises the western margin of the Markagunt Plateau at the transition between the Basin and Range and Colorado Plateau physiographic provinces. Deformed Mesozoic sedimentary strata in the transition zone are exposed in the lower several miles of the canyon; however, at the landslide, the canyon is in the Colorado Plateau proper, and rock units are largely undeformed, dipping a few degrees to the east. The stratigraphic section at the landslide includes the cliff-forming Tibbet Canyon Member of the Straight Cliffs Formation, and the underlying slope-forming Tropic Shale and Dakota Formation, all Cretaceous in age. The 600-foot-thick Tibbet Canyon Member is chiefly fine- to coarse-grained, limey sandstone; the 30-foot thick Tropic Shale is sandy mudstone and muddy sandstone; and the greater than 600-foot-thick Dakota Formation is chiefly interbedded mudstone and sandy mudstone with thin sandstone beds and coal horizons up to several feet thick. About a half mile west of the landslide, SR-14 leaves the bottom of Cedar Canyon and begins climbing the steep, south canyon wall toward the top of the Markagunt Plateau. The Tropic Shale and Dakota Formation are exposed in the lower part of the canyon wall and are susceptible to landsliding. Published reports of landslides along this section of SR-14 go back to at least 1949, and a similar large landslide (estimated volume 2 million cubic yards) just west of the current slide closed SR-14 for several months in 1989. 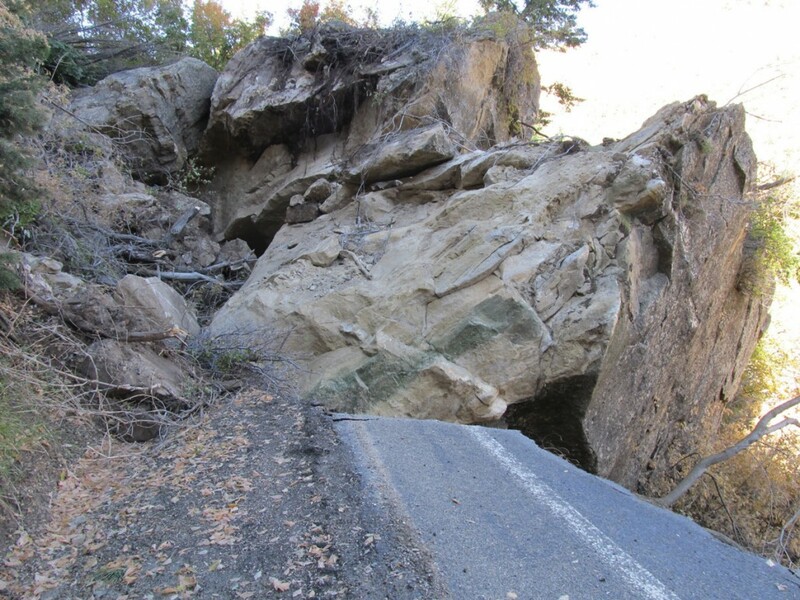 In 2009, a large rock fall (estimated volume 60,000 cubic yards) detached from the Tibbet Canyon Member cliff at this location and closed SR-14 for several days (see article in Survey Notes, v. 41, no. 3, September 2009). Most of the rock-fall material fell onto what is now the western flank of the 2011 landslide. An examination at that time showed no evidence of associated landsliding either prior to or following the rock fall. The present landslide is a complex debris slide that originated at the base of the Tibbet Canyon Member cliff in the Tropic Shale and Dakota Formation portion of the stratigraphic section. However, the extent to which the underlying bedrock and pre-existing landslide deposits are involved in the sliding is unclear. A thick section of colluvium and talus had accumulated at the base of the Tibbet Canyon Member cliff, and it is that material that comprises the landslide at the surface. UDOT has undertaken a geotechnical investigation to determine whether bedrock or ancient landslide deposits were involved in the failure, the depth and orientation of the failure plane, groundwater conditions in the slide mass, and the extent to which the landslide may have included a component of rotational movement. The immediate triggering mechanism for the 2011 landslide was a rain and snow storm that moved through the area the previous day and evening. The longer term cause is undoubtedly more complex, possibly involving loading from the large 2009 rock-fall event, erosion of the slope toe by Coal Creek, and the presence of several thousand feet of abandoned coal-mine workings beneath the landslide area, all combined with a wetter-than-normal 2010–11 winter that may have raised the groundwater level and pore-water pressure in the pre-failure landslide mass. At least three abandoned coal mines are known to be near the landslide, but the extent to which underground workings may have contributed to this and previous landsliding at this location is unclear. 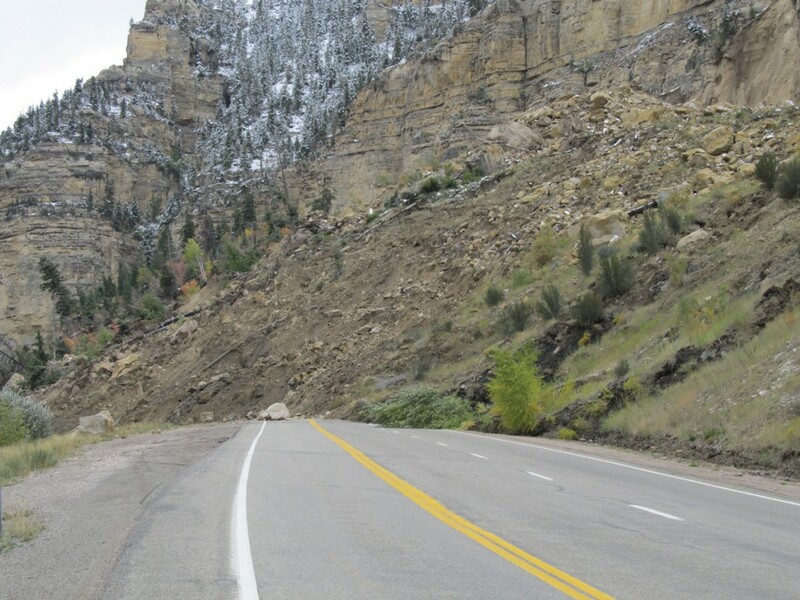 UDOT has completed the planning and design phases for a new roadway across the landslide. Construction began in mid-March 2012, and a temporary road across the landslide is expected to be available for limited public use by early summer. UDOT hopes to fully reopen SR-14 by July 4, 2012.